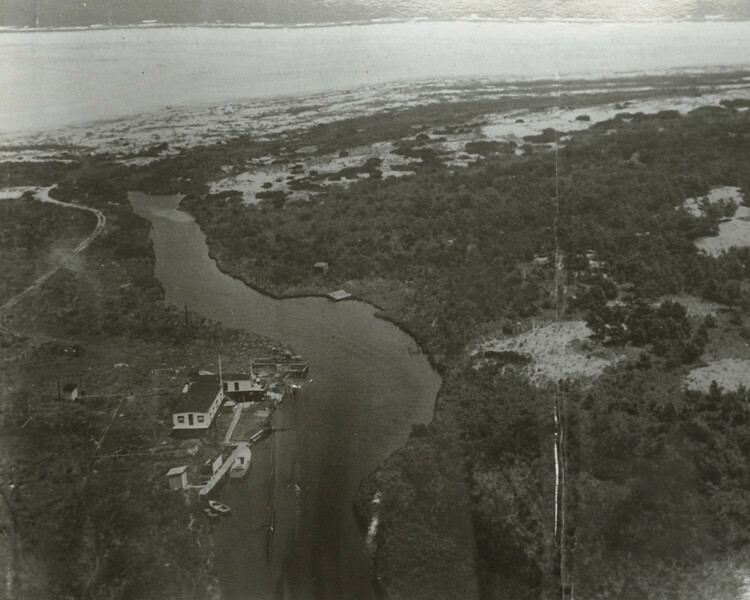 The Original Green Run on Birch's Creek, oldest image available. This photo is the original Green Run Lodge, located on Burch's Creek. Date of the photo is unknown but it was prior to 1947. At the time of the photo it was just a gunning lodge, however it was enlarged later and slot machines were installed as well as a "formal" dining room. This was a very cool place! The slots attracted a new group of folks to the island including an aviation club who's members flew down on the weekends to dine and gamble. Airplanes were able to land on the beach and there was even aviation fuel available for the planes. The lodge was owned by the Jackson family. This photo is courtesy Dewey Parsons, a local pilot who landed on the beach many times. Dewey both fished and hunted Assateague all his life, well not "all" his life 'cause he ain't dead yet! Many, many thanks to him and his wife for showing me the aerial photos and giving permission to share them with you! Any chance that you know any of the history of the house south of the Clements house off of Bayberry? It probably was a summer beach house rather than a lodge. Thanks for sharing these photos. You only show the lodges on the Maryland side of Assateague. There are a dozen more on the Virginia side.